Unionized bank employees staged an industry-wide strike Friday to protest against a plan to introduce a performance-based salary system. Banking sources said fewer than expected bank workers took part in the protest, leading to no major disruptions of banking operations nationwide. 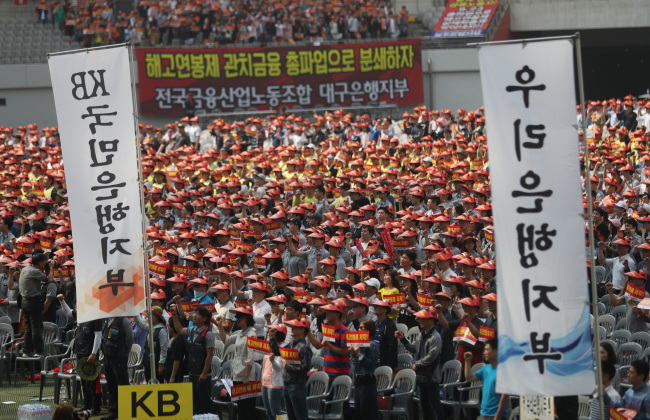 According to an estimate by the Financial Supervisory Service, as of noon, about 18,000 to 20,000 members of the Korean Financial Industry Union gathered at the Seoul World Cup Stadium in Sangam-dong, Seoul, in protest against the government-led expansion of the performance-based salary system. However, the labor union claimed about 65,000 members were present as of 1 p.m. The KFIU earlier warned financial authorities that as many as 100,000 members from all commercial banks across the country were going to participate in the strike, the third of its kind, and threatened that as many as 10,000 brick-and-mortar bank branches would be paralyzed. The banking industry held similar strikes in September 2014 and July 2000. The FSS estimated that about 15 percent of the total workforce of the banking industry appeared at the stadium, and less than 3 percent of the total employees at four major banks – KEB Hana Bank, Shinhan Bank, KB Kookmin Bank and Woori Bank – did so. Those banks have prepared contingency plans against workforce shortages, but none of them have been implemented yet. “In my personal opinion, it won’t be easy to take part in the strike considering the reality as a banker, even though I am a member of the trade union,” said a senior manager at a major commercial bank anonymously. State-run Industrial Bank of Korea and NH Nonghyup Bank showed higher participation ratios than the other banks. According to IBK, about 3,500 or 37 percent of its employees were estimated to have joined the walkout. Most commercial banks have already adopted the system in response to a government initiative to reform the financial industry, but the adoption was limited to executives and branch managers. The remaining employees are still subject to a seniority-based salary system that does not take differences in performance into account. The government urged the banks to expand the system stating with state-owned financial institutions earlier this year. In July, the Korean Federation of Banks provided enhanced guidelines for the performance-based salary system for private commercial banks, which will widen the difference between the salaries of the top performers and worst performers to 40 percent. Yim Jong-yong, chairman of the Financial Services Commission, said Wednesday, the latest strike against the performance-based salary system would not win the support of the general public and chastised the trade union for refusing to discuss measures to iron out differences. The authority had expected the participation rate to be low.